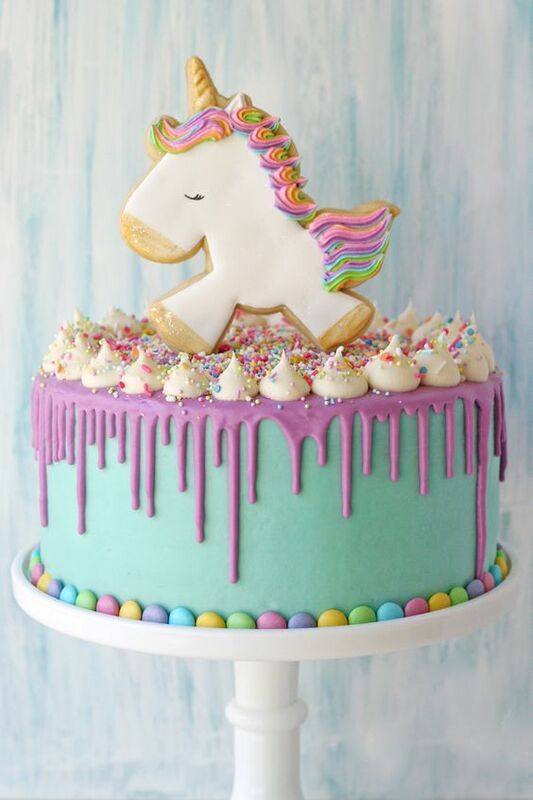 Love them or hate them, Drip cakes are here to stay. Whether you go in for the melted icecream style made famous by Katherine Sabbath, or if you are takin’ yo drip to another level, there’s no shortage of dripage about! I’ve put together a few of my favourites, as well as some handy Drip Tips to get your cake game on point! One of the most elegant ways to use a drip, is to paint it gold. You can use ganache, or Royal Icing, either way, make sure you use EDIBLE luster or paint, as food safe isn’t safe enough! You can even make your drips drip the other way! Sorcery! Pretty in pink, by Moreish Cakes. Drips work on so may levels (see what I did there? ), and they perfectly compliment this stunning rustic cake from Kadi Bakes. The florals are even from the venue’s surrounds, isn’t that cool?! Consistency is key! Chunky blobs of chocolate that look like an overflowing washing basket just spoil your hard work. If you are using ganache, make sure you thin it so its runny, but not so runny that it only ices the board! If you are heating up chocolate or ganache, be sure to let it cool slightly before adding to your cake, ESPECIALLY if you are using Buttercream! Eeek! Here’s a perfect example of simple perfection from Glorious Treats. I don’t have words really, just oooooohhhhaaaahhhhhh ❤️Absolute stunningness from Liggys Cakes. When applying your drip, remember that the top needs to be pretty too! Some people like to pour the drip on the top, and smooth it out, allowing it to drip over the edge, which gives you an even finish, but CAN cause you to get big sheets of chocolate, rather that delicate drips. I like to create the outside drip, then fill it in. This gives you complete control over the drip part, BUT it can make the seam between the edge and the top kinds bumpy. Its best to work quickly, and keep the mix nice and thin on the top. And if possible, top it with an adorable Bunny like Jenelle’s Custom Cakes. Your palette is important too, and mixing colours into chocolate can be tricky. Its best to use powdered and/or oil based food colours when colouring chocolate. You can also now buy premixed chocolate drips from our friends at Caker’s Warehouse! 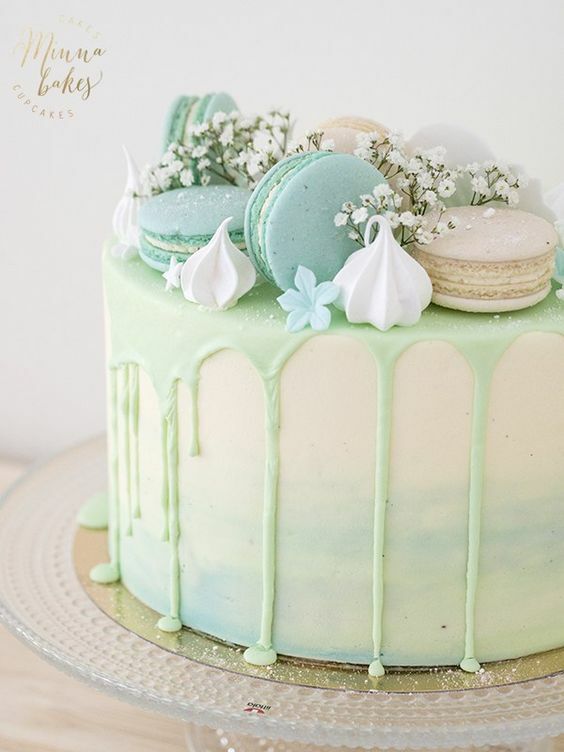 Loving this sweet pastel green combo by Minna Bakes. Wowsers! There’s nothing ‘square’ about this cake! (the puns don’t get an better peeps, sorry about that). Loving this amazing creation from Sincerely Sam Cakes. 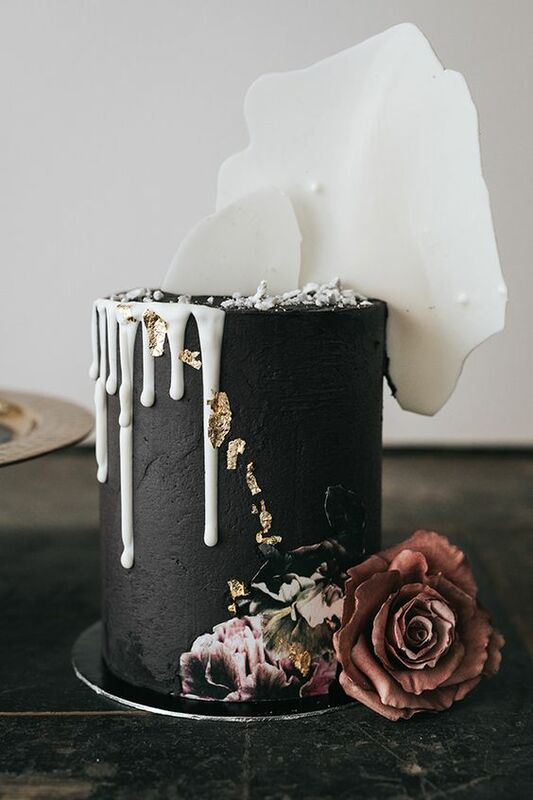 When your cake is dramatic, your drip doesn’t have to be! Here’s a beautiful use of colour relief here by Delicatesse Cake. You don’t have to smother your cake in chocolate (not that that’s a bad thing, like, ever!) Here’s Torty od Lorny using my favourite drip method, patches. It adds a lovely feature to your cake, and adds the drippy feel, without over powering your cake. You don’t need to fill in the top level either. Score! Have you made a drip cake? Share on my Facebook page!